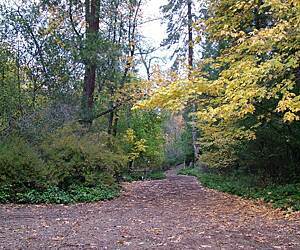 Looking for the best Running trails around Medford? 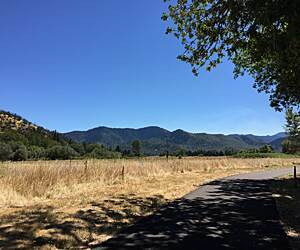 Find the top rated running trails in Medford, whether you're looking for an easy short running trail or a long running trail, you'll find what you're looking for. Click on a running trail below to find trail descriptions, trail maps, photos, and reviews. Beautiful and easy trip but not shaded as described! Walked all but .5 miles of this trail yesterday, starting at the Rogue River Rest Stop (where you can park for four hours for free). The beginning of the trail (starting at the rest stop) is shaded and the paved trail runs alongside the camp grounds. There is a secondary gravel trail that runs right along the bank of the river for about 2 miles. It is not accessible for bikes but is easy to walk and has a lot of access to the river. At just about the 2 mile mark (again starting from the rest stop) the shade ends! We did not encounter any shaded areas for the last half of the trail which is why we turned back before finishing. It got way to hot with the sun directly on us and heat radiating up from the asphalt. It was still a great walk, lots of cyclists were out and it was beautiful. Would do it again, only this time I will be prepared for shade only on the first half. Even though there was a little rain, I enjoyed this very scenic ride along the Rogue River very much. I'm looking forward to riding it again in the summer. One of the best leisure rides with wildlife, creeks and shops to refresh along the way. However it's best to avoid the trail from medford south to central point (too many bums/druggies hang out around there), but medford to Ashland is sublime. I've been riding it over 8 years. The Greenway has since had major work done on it; there are only about two rough spots on the path near the Phoenix portion. The rest is as smooth as glass. This is a great cycling trail especially if you don't want to deal with traffic during the weekdays to use the numerous backroads in Jackson County. It gets more important as one gets older and doesn't want to deal with cars as much. I am hoping someday the foundation finally gets this Greenway connected with the Rogue River one so that there is a nonstop bike trail from Ashland to Grants Pass. Transients aren't any bigger a deal here than anywhere else the country. I've never had trouble with them or with other people. And yes, police do patrol this Greenway; I have seen them numerous times. It's no more unsafe than other bike trails in the country. I rode a portion of this trail today and was apprehensive from reading the reviews but would like to share what I experienced today. I rode to Phoenix from Ashland and had a very nice ride. The trail was not bad really. The few spots that were mark we're okay. It appears sections have been worked on and new cement poured that made it nice. Didn't encounter any transients along the way and going by the trailer park was not bad. A couple of people out on their patios were quite friendly. These folks are doing the best they can with what they got and I admire their efforts. There were several riders out today and very friendly. I don't know what the trail is like beyond Phoenix but the part I did today was pleasant. There were several walkers as well. I hope more folks can share their experiences so that the trail gets used. Yes you do go along a section next to I5 but it isn't that long. The short part on 99 was okay too. No complaints. Traveling up or down I-5? Want a break? Want to ride something? Here is a scenic little four mile trail with one end at the Depot St. Bridge in Rogue River and the other just beyond the Valley of the Rogue State Park rest area. In between it runs through the meadows below the Valley of the Rogue campground loops, then dives into the brush between the river and the freeway and winds around and up and down to the trail end at the new Depot St. Bridge. Here is the best trailhead. Lots of parking, restrooms, water, tourist information office, picnic tables, river views and - if you have luck - covered parking beneath the bridge with a view of the boat launch (always run to watch). TB surveyed this trail in several parts owing to the wretched weather that seems to follow him north on the spring migration. One season he spent some time below the bridge making tea while the rains sluiced down on both sides. Too wet to ride. The next season he got in a ride from the bridge up into the park campground. The following season he surveyed down from the eastern trailhead to connect the dots. If the weather is with you, ride out from under the bridge, cross over it and turn left. You will make a downhill loop to the dedication plaza and then on to some dry under-bridge viewing of the river and trailhead on the far shore. On the near shore is a stump carved into a pair of salmon. Ride on. The trail enters a twisty section through the woods that climbs and falls for a bit over a mile. It then exits the woods and enters the meadows of the Valley of the Rogue State Park. Here are wide views of the valley. What you don’t get are views of the river. Too much brush in the way. There is a ped trail that goes along the river edge in the park if you are hunting river views. Here is your eastern trailhead – the rest area. Plenty of parking, picnic tables, restrooms, water, shade – but no overhead cover. The trail crosses the access road to the east of the parking area. It then circles below the freeway bridges, crosses the highway and ends just short of the RR tracks. Ride done. Now you can retrace your route to the bridge. Searching for dry riding weather in the NorthWet. I have ridden almost the entire lenght of the trail and I have some words of caution: The trail has been poorly maintained in numerous spots, with tree roots pushing up and creating rough spots. Someone has circled these areas in painted green and as most are in shaded areas, the rider is upon the rough spots without warning. To an inexperienced rider, this could result in loss of control of the bike. 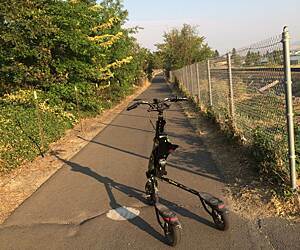 More importantly, the trail winds through a park like setting for about a mile in downtown Medford. This is where the transients hang out. These people pose a threat to anyone coming by on a bike: they will not move out of the way; the vast majority are either drunk or on drugs; some are either lying in the bike path or right along side of it; and you will note a varied assortment of beer/wine containers on the path with some broken glass. I highly recommend carrying either mace or pepper spray. When approaching this area, I would recommend you place the spray in an easily accessible area, preferably either around your neck or in a pocket and be ready to use it. If you are female, I would highly recommend you travel with more than one person. As a male, I ride through the area with both hands on the bars and I never ever make eye contact with these people - you are inviting trouble if you do. I am told the MPD mades periodic visits and chases them out, however, I have yet to see any Police presence. On the North end of the trail as it crossed back to the East and follows I-5 North, (I am traveling South to North) there is a bridge crossing a small stream. There is a huge hole in the middle of the bridge that someone has painted in florescent red paint to alert an approaching rider. If you were to hit that hole, it is wide enough and deep enough to collapse a wheel. On the South end of the trail near Ashland be aware of 'goat heads' along the trail. These are thorns that will destroy tires in a heartbeat. In summary, this could be a very nice trail, similiar to the trail along the Spokane River or the Trail of the Cour d'alene's, but its over all condition is not good. 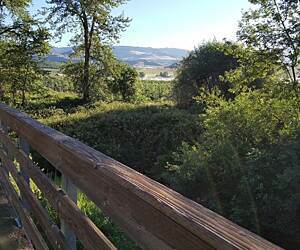 I would advise anyone traveling in or around Medford to use the roadways as there are a lot of bike lanes which are maintained and some fabulous scenery through the wine country and orchards.